A lot of preparation, a lot of phone calls and much hope were necessary, but then finally – it happened. 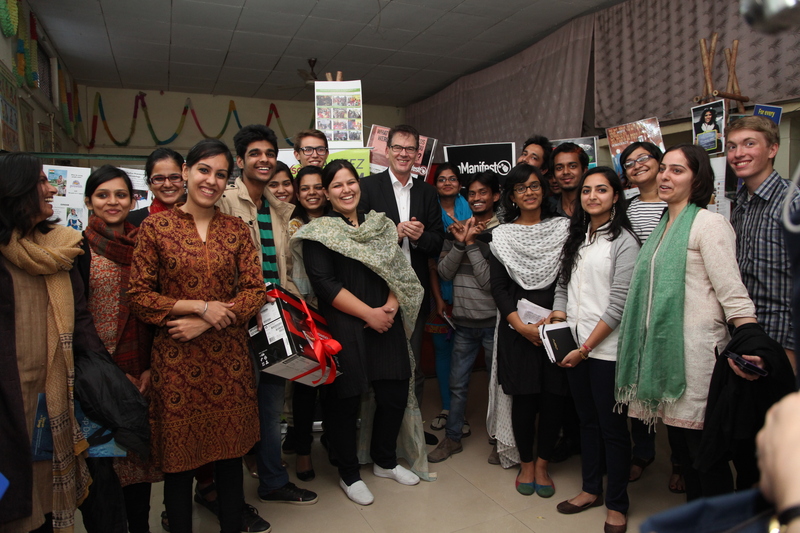 The German Minister of the Development Cooperation visited the work of Pravah, displayed in the Old Delhi Night Shelter of the NGO Butterflies, and listened to the presentations of young Smilers. In November 2013 a staff woman from the German Embassy asked if I would investigate the possibility of a site visit to Pravah by a high dignitary. 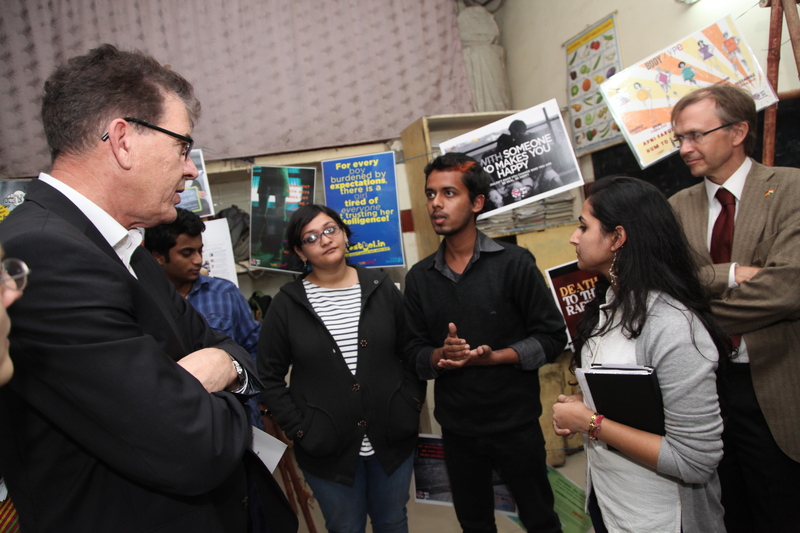 I agreed, because I knew that Pravah had some great projects to offer and with its partnership with Misereor (an agency that is independently funded by the German Ministry), Pravah would be a good example to display the impactful work that had been done. In the first month of 2014 his plans became more concrete. The German President would visit India for a meeting with the Indian President, and the new Minister for Development Cooperation would come with him. Aside from the official program, which was stuffed with meetings of politicians and other high-ranking persons from the Indian society, there would be a small time window for the Minister to hold a meeting with NGOs. We decided to present several Pravah projects via a gallery walk. We wanted to create a free space were a conversation between the young people and the Minister could easily happen. We were told that he had a special interest in the young people’s perspective on the Indian society. We prepared materials on 4 topics: Pravah, unManifesto, MustBol, and the Post-2015 India Report (featuring work from Pravah in the youth section). On the morning of the 8th of February, Hano and I drove to the Night Shelter. We brought five ladders with us, which we wanted to use as the presentation surface. After some miscommunication between us and the staff of Butterflies, we were able to set up the Gallery. Just before the minister entered the room, the volunteers and the Pravah people came. After he had a discussion with the children he came to Pravah. With great interest he followed the presentation of the volunteers. He asked a lot of questions and tried to get deeper in the material. He wanted to know some more details about the background of the students and their views on Indian societies. At the end he thanked everyone and held a speech. He said that the meeting was really interesting for him and it would be great to see something different from the office rooms of high politicians. He said that the support through Misereor should be continued and he would speak with the head of the organization. At the end he said that he wouldn’t forget this meeting with these young, enthusiastic and dedicated people at least for the next 20 years – let’s hope so. Sven Przywarra is a volunteer at Pravah. He came to Pravah in 2013 from Germany (through Misereor) and will be partnering with Pravah for a year. Pravah’s richness is found not only in the waves of our programs, but also in the diversity of our staff and volunteers. If you are interested in partnering with Pravah as an organization or an individual volunteer, please email faiza@pravah.org. Also, Pravah is currently recruiting for staffing positions. If interested, please email jobs@pravah.org for more information.